All about the CareerWhit Assessment | Rick Whitted | Your Personal and Career Mentor. What exactly is the CareerWhit Assessment? It’s a great first step to aligning your career decisions to your core values. Let me be clear, this assessment is not about determining your strengths, weaknesses, personality or character traits. It’s about answering one key question: What is my definition of career progression? Said another way, how do I define promotion? Making career decisions that do not align with our core career values can lead to job dissatisfaction, career impatience, disengagement at work, and even quitting. However, when we manage our career decisions and expectations by what we value most; we have the best chance of thriving at work and building a successful long term career. If you’ve gotten this far and haven’t taken the test yet, you should go take the test now. The most common question I receive from those that take this assessment is, I’d encourage you to read my article 3 Hard To Accept Facts That Can Transform Your Life & Career. In this article I tackle what is the motivation behind our career decisions; and more importantly, how we emotionally view our progression at work. This is a different discussion on how we think about our careers. So, I would encourage you to pause and not try to consume this material all at once. Your test results should serve as a guide post, or a mile marker, on your career path journey. You should come back often to review them. As well, you should retake the assessment at least once every year; as life events can heavily influence our career perspectives. CareerWhitt Newsletter – Scroll to bottom to subscribe. This once a week publication includes my weekly blog post article, links to my latest podcast episodes, and additional career advice, tips and, at times, giveaways. With more than 100 episodes of honest and up front career advice from myself and other successful manager and entrepreneurs, this resource will give you a front row seat to some of the most practical career advice for today’s workplace environment. 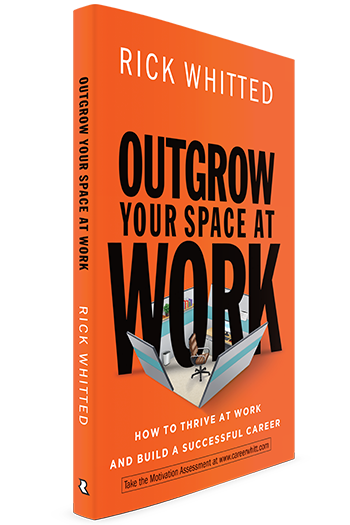 Based on over 2 decades of workplace experience and research, the CareerWhitt Assessment tool works in tandem with Outgrow Your Space At Work: How To Thrive At Work And Build A Successful Career. It will provide you with practical ways to apply your test results to your career. Start enjoying your career path journey today. It really is possible to not only be successful, but to thrive at work and build a successful career.